Malaysia is experiencing a record heatwave. Forest and peatland fires have sent haze into Kuala Lumpur, and contaminated the air elsewhere in the country. Near the capital, fires are burning in a giant illegal waste dump. Struck early this year by the annual haze scourge, Malaysia has proposed to amend the Environmental Protection Act so that the state can seize badly burning land, often set alight by palm oil interests looking to clear land cheaply. “It will not matter if the land is owned by smallholders or plantation giants — as long as there is a substantial fire, the government will take control of the land,” Malaysian Environment and Natural Resources Minister Wan Junaidi Tuanku Jaafar said at a press conference on Wednesday. A major heatwave in the Southeast Asian nation has depleted water reserves and encouraged fires to spread, including in the peat-rich Kuala Langat Forest Reserve and in an oil palm plantation run by Malaysian’s Federal Land Development Authority (FELDA). 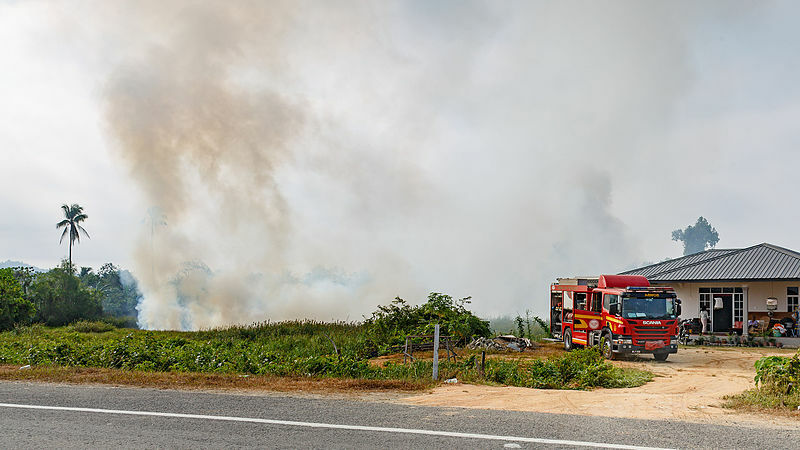 In Selangor state near Kuala Lumpur, fires are burning in an illegal garbage dump spanning eight hectares, “where trash was burnt by scavengers looking for scrap metal,” the Straits Times reported. “I have experienced putting out many fires but this is difficult because of the smell, and the smoke is rather toxic,” firefighter A. Selvarajoo said. Junaidi’s ministry detected 1,460 cases of open burning between January 1 and Monday. “Existing laws are unable to prevent open burning…so we want firmer action In Sarawak, we call it ‘re-enter the land’ where the land is handed over to the government,” he said. The government this year has already recorded 200 cases of heatstroke, including two deaths. Last month, a police officer died in Johor, and a 23-year-old trainee at a course for volunteer servicemen passed away more recently.